On AuSable (Fish) Point near Oscoda, MI. Wrecked in gale while in tow of steamer SS WILHELM with schooner barge MEARS. 1890, Dec 31 Enrollment surrendered, Detroit. 1856, May 16 Enrolled Cleveland, OH. 1857, Sep Aground Gratiot Rapids, St. Clair River. 1858 Ran Cleveland - Lake Superior carrying coal & iron. 1858, Jul 16 Owned Sir Francis Drake & Robert McLaughlan, Cleveland. 1859, Mar 5 Owned F. Drake & Lemuel Crawford, Cleveland. 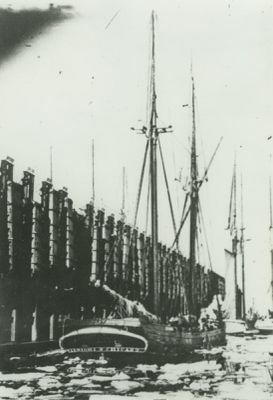 1859, Mar 14 To take cargo of lumber to San Francisco & run to Humboldt Bay during the winter. 1859, Nov 19 Damaged, Lake Huron storm. 1860 Owned Crawford & Price, Cleveland. 1861, Aug Aground Peach Island, Detroit River, coal laden. 1861, Sep Aground Bar Point, Lake Erie. 1862, Apr Damaged in tow on St. Clair River. 1863 Owned S.F. Drake, Cleveland. 1863, Sep Damaged in collision with propeller FOUNTAIN CITY. 1865, Apr 26 Remeasured Cleveland, 136.58 x 26.16 x 11', 287.78 gross / 273.39 net tons. 1876 Owned McDonald & Hale, Chicago, IL. 1876, Aug 26 Collision with prop OAKLAND, Bay City, MI. 1877, Aug 13 Owned William McDonald, Bay City. 1881, Mar 28 Owned Emory J. Vance et al, Bay City. 1882 Towed by BENTON in Cleveland & Saginaw lumber trade. 1888, Jan 11 Owned E.J. Vance, Bay City. 1888, Dec 15 Receiving new deck beams at the McLauglin slip, Bay City. 1889, Nov 29 Wrecked, Lake Huron.